More threats from Cure supporters.. Please share widely, as this kind of behaviour by Cure supporters needs to be exposed. 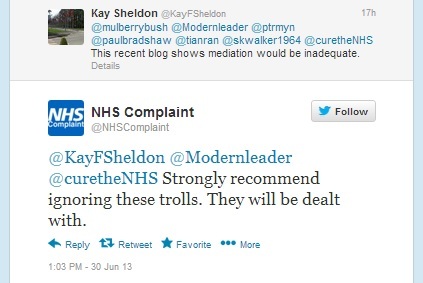 I wrote a couple of days ago about the threat by NHS ‘whistleblower’ Gary Walker to call in the police and accuse me of harassment for speaking out about Julie Bailey and her group, Cure the NHS (Cure). He’s not the only Cure supporter to resort to barely-veiled threats – at the same time handily revealing the real nature of Cure and its allies, one that is conveniently ignored by anti-NHS or otherwise compliant media. This becomes even more obvious when you consider the context. Mr Edwards, a histrionic character with an apparent liking for melodrama as well as a very high opinion of his own significance, is the character attempting a private prosecution for manslaughter against David Nicholson, the outgoing head of the NHS, for his supposed role in deaths at Stafford hospital. 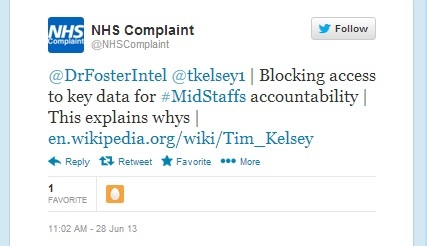 Leave aside the fact that Nicholson’s connection to events at Mid Staffs is tenuous at best. 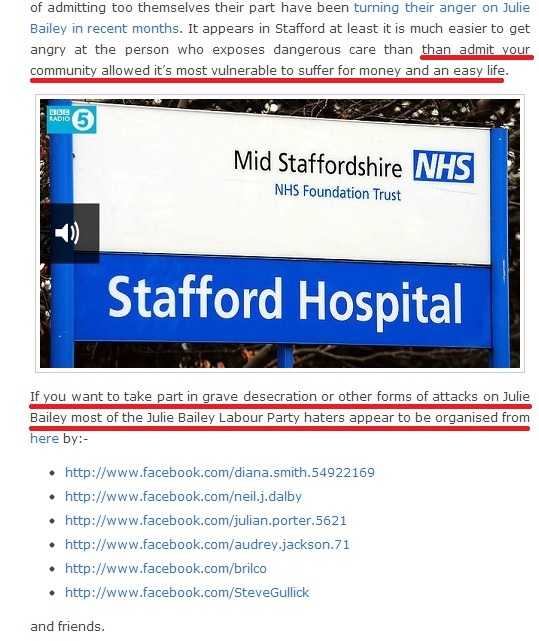 Leave aside the fact that events at Mid Staffs are nothing like they’ve been portrayed by the media, and that independent clinicians who reviewed the deaths at Mid Staffs found that ‘perhaps one’ was questionable. A whole town ‘allowed the vulnerable to suffer for money’? I won’t bore you with more of his venomous ramblings, but these examples perfectly illustrate the seemingly-unhinged nature of Mr Edwards’ thought processes. So, an unstable person with a history of obsessive behaviour and a taste for baseless private crusades threatens that I and a Stafford woman ‘will be dealt with’. Interesting. threats of harm are being made to the victim or someone else – this might include indirect threats. I’m not going to report Mr Edwards for his threatening behaviour toward me, because I’m not a histrionic personality with an addiction to melodrama. However, if he repeats or acts on any kind of threat via any medium, I will, particularly because he has included a Stafford woman in his pathetic mutterings and threatening a woman is a very serious matter. You would be well advised to check the names. The article you refer to named”Gary Walker” now you call him “Gary Bailey” This very poor standard could cause a lot of damage. Please clearly state and check the names we do not need this or any other campaign ruined by sloppy work. A simple pointer would have sufficed, surely – but thanks anyway. Now changed. That or the old Man U goalie was on my mind for some reason! I find all this very disturbing, Steve, and I hope its not taking a personal toll on you and all the other targets of Cure’s venom. I’ve read a number of their tweets now and what you describe is totally characteristic. You’re right when you call it harassment and I can’t understand why they pounce on even the mildest of comment. I also noticed whilst browsing around the net that they get quite a bit of moral support from a woman called Julia Manning who’s heavily involved with a think tank called 2020 Health. She writes on the conservativehome blog quite a lot and has praised their efforts highly. 2020 Health have very strong connections with private healthcare interests. I find myself wondering if Cure get any financial backing from these people. Does anyone know where Julie got the money to publish her book which is available in paperback and as a Kindle download? Its self published not done through a bona fide publisher. I don’t know much about the business but surely it would need a significant outlay of cash. Yes, this is far from the only such link to the Tory party. I’m preparing an article on it, so watch this space! These people are seriously barking. Keep up the good work and I will keep sharing it. People like myself wouldn’t know anything but what the media churns out if it weren’t for your blog. A good small point! I highly doubt it, given the content of what he writes. This stuff from Cure and supporters is getting silly. If only they could see themselves. This bubble must burst sometime, surely. Meanwhile let’s keep arguing strongly and cogently on the facts. One thing is for sure – Cure & Co won’t be doing that. Yes, they become incoherent and vindictive when challenged – just be reasonable, it seems to infuriate them! Oooo you should be very afraid Steve, after all this is the fool that claims he is going to be the “lead prosecutor” in his private prosecution of David Nicholson. Alan Edwards appears to be suffering from a huge dose of delusion and frankly, it’s sad to witness in these days of such an excellent NHS. Does anyone know where this ludicrous “private prosecution” has got to? It may be his right to start a private prosecution, but it is also the right of the CPS to take it over and discontinue it (thankfully). 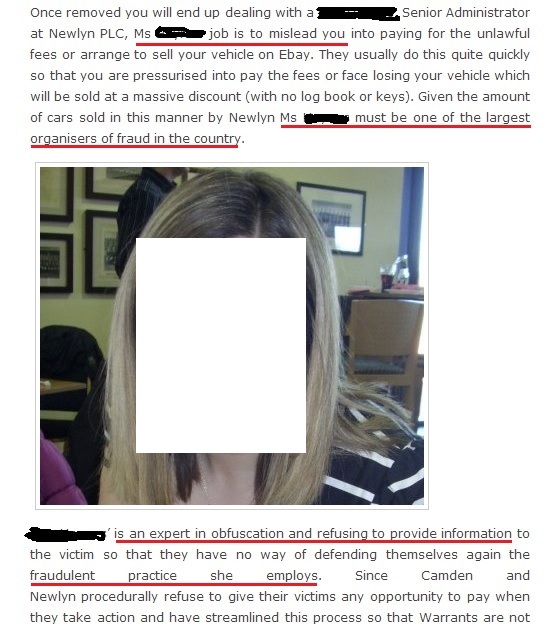 This is to avoid the exact type of legal harassment Mr Edwards is attempting.